Chilies are extremely hot and extremely healthy. Hot? Sure, we are known about this feature. We can use this spice to make hot condiment or better known as “sambal” in Indonesian term or adding them in some dishes. But healthy? Yes, they can even fight cancer. They contain capsaicin which drives prostate cancer cells to kill themselves, according to study cancer research. Another study show also those capsaicins can relief the pain that caused by migraine or headaches and it also contains antibacterial to fight chronic sinus infections. And if you have high blood pressure, maybe you could try to use this spice. It can lower your blood pressure. This hot spice contains also high vitamin C, even more than orange. It’s really amazing and unexpected. So, there are a lot of profits taking chili peppers in your daily food. It makes your food more tasteful and they are also good for your health. Chilies use in many dishes of Indonesian food. In almost every dish you’ll find it. This is one the most important ingredient of traditional cooking. Anywhere and everywhere where traditional Indonesian food are find, this ingredient make the essential part. To make very hot sambal, it can be substitute by Madame Jeanette, hot Suriname chillipepper. They are incredible hot. 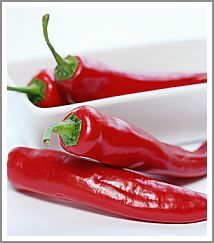 You can use fresh or dried chili peppers but you have to aware that dried form lack of taste and color. Dried chili peppers are fresh ones that have been steamed and the dried in the sun. Soak them before you use it in warm water. The advantage of dried form that you can keep them for a very long time in a dry and cool place. 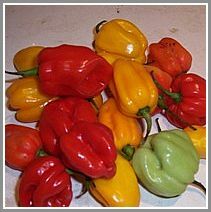 But you can also keep fresh chili peppers for month by store them in the freezer without losing taste and color. There is another kind chili peppers, the small ones, birdseye chili peppers. They are more hotter than the big ones, and usually we use them to make very hot sambal. Or just to eat them raw together with snacks like meat kroket or Rissoles, Indonesian Rolls snacks. Pound the chilies, terasi, tomato, salt and plam sugar to a paste. Squeeze the limes and add the juice to the paste. If you want more hot, replace it with small ones. If you want really, I mean really really hot sambal, baked the sambal in frying pan without oil (the olive oil is already added before in the mixture) until you smell it. It’s the best way to cooked it outside the house because the aroma could be very sharp.